The German saying Die Katze im Sack kaufen (Equivalent to buying a pig in a poke) is the topic of this multiple (number of copies: 4 ). It is known that the objects intended as presents were handed over with the words "Hier, hab' ich für Dich gekauft (Look at what I bought for you)". 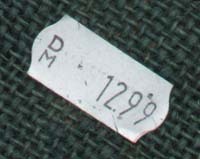 The price-tag refers to the date of origin in December 1999.